Reducing greenhouse gas (GHG) emissions by 50 percent; Producing or procuring at least 50 percent of our electric energy from renewable sources; Achieving an energy use intensity that is at least 50 percent below the national average; Achieving water use intensity that is 50 percent below the district average; and Reducing the levels of GHG emissions from university commuting and campus transportation by 50 percent. Such improvements will require dramatic action across all of our operations, especially in the areas of energy and transportation. In addition, we plan to implement green infrastructure and conservation technologies that will help reduce Pitt’s impact on the city’s vulnerable water and stormwater systems. This plan is a critical component in Pitt’s ongoing efforts to advance sustainability. The goals that it outlines are far from safe; they demand ingenuity and innovation as well as consistent and focused attention. As we begin to look to the future and shift this ambitious plan into action, I encourage you to join in. By working together, and propelled by your ideas, talents and passions, we can cultivate a thriving culture of sustainability at Pitt—one that has a far-reaching, long-lasting and meaningful impact. in the Plan’s vision: Stewardship, Community and Culture, and Exploration. Respectively, the subcommittees are chaired by Facilities Management, the Division of Student Affairs, and the Mascaro Center for Sustainable Innovation (MCSI). The committee has drafted the Pitt Sustainability Plan to carefully connect to the goals established in the Plan for Pitt (the University’s strategic plan) while incorporating the thoughts and ambitions of a diverse cross section of Pitt’s student, faculty, and staff communities. The committee identified five in-depth impact areas for each of the plan’s three themes. After several working sessions, each subcommittee developed a set of aggressive, achievable, and measurable goals for each impact area to track progress. In 2018, the University plans to establish an Office of Sustainability to coordinate efforts, foster collaboration, and monitor progress toward the Plan’s goals and aspirations. Pitt signed the Talloires Declaration, which supports mobilizing the resources of higher education for sustainability. The University established the Mascaro Center for Sustainable Innovation, which spearheads the University’s research and education programs in sustainability. The University Senate issued the Statement on Sustainability, and the first Greenhouse Gas Inventory was published, with updates in 2011 and 2014, to monitor and reduce emissions. The University published its inaugural Report on Sustainability to highlight sustainability efforts and achievements on campus. Pitt launched the Student Office of Sustainability, which is now an active voice in fostering awareness throughout the Pitt community. Pitt declares 2014-2015 the Year of Sustainability, inspiring and providing matching funds for activities throughout the campus, from courses to forums. The University Sustainability Committee was assembled to establish cross-functional representation among faculty, staff, and students who serve as advocates for sustainability at the University. AASHE STARS The University tracks its progress each year through the Sustainability Tracking, Assessment & Rating System (STARS) framework managed by the Association for the Advancement of Sustainability in Higher Education (AASHE). STARS provides a comprehensive benchmarking platform for cross-functional assessment of sustainability throughout the organization. Each year, a cross section of Pitt faculty, staff, and students works to complete the extensive survey tool, and the STARS data are shared electronically with both the Princeton Review’s annual Guide to Green Colleges and Sierra magazine’s Cool Schools survey. Pitt has earned positive recognition in both publications for the past several years. Pitt is also pursuing LEED certification for an additional nine current and recent construction and renovation projects. This Plan sets a goal to LEED and/or WELL certify all projects with value of more than $5 million. 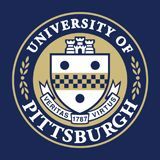 The University of Pittsburgh was a founding partner in the Oakland expansion of the Pittsburgh 2030 District and is actively working toward achieving the target of 50% reductions in energy use, water use, and transportation emissions by the year 2030. These reductions are helping the University with improved air quality, increased returns on investment and growing regional success. Actively participating in research for the 2030 District, Melissa Bilec from the Mascaro Center for Sustainable Innovation is engaged in developing a new indoor air quality metric that will be launched in all national 2030 districts. The committee identified five in-depth impact areas for each of the three themes. The 15 impact areas, represented by weighted bubbles, help to focus goals and key performance indicators for tracking the University’s progress. The size of the bubbles is meant to indicate priorities based on the connections to the Plan for Pitt and feedback from public engagement, with larger bubbles representing shorterterm priorities. FORMAT GUIDE This section explains the following pages and their elements. TRANSPORTATION AND MOBILITY We strive for convenient multi-modal access to and through our campus, prioritizing low-carbon modes and a walkable campus to promote the health and safety of our community and the environment. GOALS AND ASPIRATIONS ••• Achieve Silver-level Bicycle-Friendly University status from the League of American Bicyclists by the end of FY2020, and Gold by the end of FY2025. ••• Reduce commuter travel and direct transportation GHG emissions to 8,590 MT CO2e (50% of FY14 baseline) by 2030. ••• Increase active Pitt registered carpools by 2% and create 1 new vanpool annually between FY2018 and FY2030. ••• Reduce Pitt Shuttle fuel usage by 3% annually between FY2018 and FY2030. SUCCESS STORIES The University of Pittsburgh has a total of 16 level 2 charging stations located at parking garages on campus. Pitt’s investment in electric vehicle charging technology demonstrates a commitment to not only endorse more sustainable transportation and commuting but also to provide and maintain the infrastructure required to support it. NAOMI E. ANDERSON (ENGR ‘17): DRIVEN BY PASSION FOR SUSTAINABILITY As president of Pitt’s chapter of Engineers for a Sustainable World, Naomi Anderson coordinated projects to winterize students’ homes; test the potential of wind belts (flapping straps that can generate power); and create a rain garden in conjunction with an Oakland community group. Anderson’s interest in water resources led her to pursue international study of artificial glaciers. Anderson and her coauthor of a freshman research paper on the subject, fellow Pitt student Taylor Shippling (ENGR ‘17), were invited to travel to the mountains of northern India to research the structures up close. An avid bicyclist, Anderson joined with her friends in 2015 to found the Pitt Bicycle Collective to support the campus cycling community. She also was one of the first two students to receive the new Bachelor of Science degree in Environmental Engineering in 2017. The Pitt Bike Collective’s proposal for the Bike Cave in the Wesley W. Posvar Hall underpass won the top prize in the 2017 Sustainable Solutions competition and launched in the fall of 2017. Pitt will care for both the built and the natural environment to ensure responsible and efficient resource management and will continually strive to minimize the environmental impact of our operations. Buildings, infrastructure, and operations play a primary role on Pitt’s campuses, given the multifaceted impacts they have on resource conservation. To combat the serious threat of climate change, we aim to dramatically reduce energy consumption and associated greenhouse gas (GHG) emissions. We will cultivate sustainable landscapes that increase biodiversity and enrich all ecosystem services, which are vital to environmental and human health and well-being. GOALS AND ASPIRATIONS •• Strive toward climate neutrality, with a goal to reduce GHG emissions by 50% by 2030 from 2008 baseline. •• Produce or procure 50% of the University’s electric energy portfolio from renewable resources by 2030. •• Embrace 2030 District goals of 50% reduction below the national average in energy use intensity (consumption per square foot) by 2030 (from 2003 baseline) and establish design standards and operational practices to achieve them. GOALS AND ASPIRATIONS •• Adhere to Pitt’s Sustainable Landscape Design Guidelines in all new landscape designs. •• Increase tree canopy by 50% and replace 15% of lawn area with indigenous and adapted plants by 2030. (from 2017 baseline). •• Maintain at least 75% of landscaped areas in accordance with Northeast Organic Farming Association (NOFA) Standards for Organic Land Care by 2024. SUCCESS STORIES The Carrillo Street Steam Plant is one of the cleanest university heating plants in the United States, emitting relatively little pollution for a facility of its size. Prior to the plant’s construction, Pitt’s steam supply was generated primarily from coal. Ultra-low NOx boilers and state-of-the-art emissions control technologies enable the Carrillo Plant to reduce the rate of GHG emissions by about half when compared to the emissions of a coal-fired plant. SUCCESS STORIES In the spring of 2010, a group of students identified a vacant and blighted lot on Oakland Avenue and envisioned its transformation into a green space. The students jumped for joy after the groundbreaking of the Oakland Avenue Garden in the fall of 2010. The management of the edible garden has now transitioned to the Plant2Plate student group. We strive for convenient multi-modal access to and through our campus, prioritizing low-carbon modes and a walkable campus to promote the health and safety of our community and the environment. GOALS AND ASPIRATIONS •• Achieve Silver-level Bicycle-Friendly University status from the League of American Bicyclists by the end of FY2020, and Gold by the end of FY2025. •• Embrace the 2030 District goal of 50% reduction below the district average greenhouse gas emissions from commuter travel and direct transportation by 2030 (from FY14 baseline). •• Increase active Pitt registered carpools by 2% and create 1 new vanpool annually between FY2018 and FY2030. •• Reduce Pitt Shuttle fuel usage by 3% annually between FY2018 and FY2030. We will strive for sustainable consumption and diversion practices by considering sourcing, usage, and ultimate disposal at time of purchase. We will strive for responsible consumption of potable and nonpotable water sources and use best-practice storm water management and reuse on campus. •• Establish procedures, policies, practices, and educational tools to reduce the quantity and environmental impact of materials entering and exiting the University. •• Reduce landfill waste by 25% by 2030 from 2017 levels. •• Use healthy products for our built environment in accordance with future Pitt Green Building Standards. •• Expand the food waste composting program to compost 50% of food waste by 2025. SUCCESS STORIES Students Liza Boulet (A&S ‘14) and Jessica McDonald (A&S ‘14) launched the BYO[Bag] program in 2014. Since then, the program has managed to reduce plastic bag use on campus, preventing more than one million bags from being used and raising more than $3,500 for the Pitt Green Fund through the program’s bag fee. •• Work with the City to ensure clean, healthy drinking water for all in our community. •• Strive toward a water neutral campus, with a 3% reduction in water use by 2020 from 2017 baseline. •• Embrace the 2030 District goals of 50% reduction below the district average in water use intensity (consumption per square foot) by 2030 and establish design standards and operational practices to achieve them. •• Reduce impervious surfaces by 20% by 2030 from 2017 baseline. •• Divert 25% of storm water from remaining impervious surfaces to rain gardens, bioswales, or rainwater harvesting tanks by 2030. SUCCESS STORIES As part of drainage system upgrades to the Cathedral of Learning lawn, a rain garden was created to manage the runoff of the system in an environmentally sustainable manner by allowing it to filter through natural vegetation. The rain garden area also has a stone perimeter and can be enjoyed by students, faculty, staff, and visitors as a peaceful seating area. Through the integration of a creative, multidisciplinary curriculum, groundbreaking research, and social engagement, Pitt will educate every member of its faculty, staff, and student communities on sustainability, foster and support its environmental leaders, and promote innovation to contribute to a more sustainable world. We will use sustainable principles to prepare students to lead lives of impact through a supportive environment focused on holistic and individualized approaches to learning inside and outside the classroom. We will advance the frontier of knowledge and make a positive impact on the world through collaborative and multidisciplinary approaches to sustainabilityrelated research that focuses on areas of great social and environmental need. •• Engage all undergraduate advisors and give them the tools necessary to connect interested students to sustainabilitythemed courses, majors, minors, internships, and community activities. •• Use the Pitt campus as a living laboratory for faculty and students to implement new ideas and study outcomes over time. •• Annually increase the number of students applying for and graduating with the Undergraduate Certificate in Sustainability starting with the 2017-2018 Academic Year. •• Provide more opportunities and incentives for interdisciplinary research as well as the bridging of academics and operations – promoting an environment of informing and working together. •• Increase sustainability-related service learning opportunities. •• Raise external funds for endowed chair(s) to support faculty with research expertise in sustainability. •• Incorporate sustainability education into all freshman seminars. •• Develop an endowed seed grant fund to provide greater opportunity for sustainability focused federal grants. •• Create faculty tools, workshops, and incentives to encourage the incorporation of sustainability components into current syllabi. •• Increase prestigious scholarship opportunities for undergraduate and graduate research in sustainability. •• Raise the visibility of faculty research in sustainability. SUCCESS STORIES Each year, instructor R. Ward Allebach inspires his students to innovate and create sustainability programming through his courses at Pitt. The Student Sustainability Symposium, which he organizes, showcases students’ work in university focused sustainability projects and is a popular and well-attended event. SUCCESS STORIES Researchers from the MCSI collaborated with the Green Building Alliance (GBA) and the Pittsburgh 2030 District on a pilot study on energy improvements made in harmony with air quality considerations. We will strive to ensure that our research translates into innovations that positively impact our community and the environment. GOALS AND ASPIRATIONS •• Increase the number of sustainability-related patents, licenses, and start-ups (both for profit and non-profit). •• Collaborate with Pitt’s Innovation Institute, the University’s hub for innovation and entrepreneurship, to embed sustainability principles throughout the Institute. •• Work across impact areas to define innovations and ensure that there is a mechanism for students, faculty, and staff to advance ideas for impact. SUCCESS STORIES The Student Office of Sustainability and the Office of PittServes host the month-long Sustainable Solutions competition each spring term. The competition offers student teams an avenue to create and develop their campus sustainability ideas in a supportive atmosphere. The winning idea receives a $10,000 implementation budget. Past winners have developed energy efficient renovations for residence halls, solar-powered waste compactors, permaculture gardens, and the Bike Co-Op project. Laura Zullo joined the Facilities Management Division 29 years ago, and her contributions to Pitt as Senior Manager of Utilities and Sustainability have helped the University to significantly reduce its carbon footprint. Zullo realized early on that energy and sustainability initiatives also could contribute to the bottom line and made it her mission to take steps toward sustainability. On any given day, Zullo might be analyzing data from the buildings she manages, collecting statistics for submission to the Princeton Review’s Guide to Green Colleges, or scooping up bottles and papers alongside students for the RecycleMania competition. Championing sustainability, she established the University Sustainability Committee and was the committee leader for the Pitt Sustainability Plan. Her efforts have helped to foster collaboration among faculty, staff, and students for the successful implementation of the plan. Zullo has recently taken a new role as Director of Administration in the Office of the Senior Vice Chancellor for Business and Operations and continues to advocate for sustainability at Pitt. GLOBAL OUTREACH We will engage with the world through sustainability to explore and address issues that improve global quality of life. GOALS AND ASPIRATIONS •• Increase the number of sustainability-related international service projects. •• Track sustainability-related service and study abroad opportunities for students. •• Find alumni who are leading sustainability initiatives both nationally and internationally and connect them with University faculty and students. •• Promote sustainability-related topics at industry and academic conferences to tell our stories of impact to greater audiences. PARTNERSHIPS We will support sustainability through a robust capacity to partner. GOALS AND ASPIRATIONS •• Connect with industry and community collaborators to support applied sustainability research and education. •• Establish local and regional partnerships to accelerate the transfer of sustainability ideas from Pitt classrooms and laboratories through implementation. •• Link sustainability and Community Engagement Centers more explicitly. •• Invigorate our existing programs to increase the impact of sustainability education in the K-12 curriculum. •• # of sustainability-related international service projects. •• # of contributions (i.e. presentations, papers, abstracts) at sustainability-related conferences. The University of Pittsburgh has made a commitment to the sustainability efforts within the community of Millvale, Pennsylvania. The Office of PittServes partners with the community to send volunteers for large-scale days of service as well as smaller, more targeted sustainability projects throughout the year. University of Pittsburgh Chancellor Patrick Gallagher has announced the formation of the Chancellor’s Global Advisory Council (CGAC) in support of the University’s global strategy. Composed of accomplished alumni from eight countries and multiple sectors of the global economy, CGAC will advise the Chancellor and academic and administrative leaders on research, education, and outreach activities that will help improve quality of life globally through cyber security, sustainability, human rights, and other impact areas. COMMUNITY AND CULTURE Pitt will strengthen its campus and communities by creating a culture of shared responsibility for our impact on surrounding communities, the region, and the world. This will be achieved by supporting and facilitating opportunities for students, faculty, and staff to be active participants in advancing the Universityâ&#x20AC;&#x2122;s social, economic, and environmental sustainability goals. We will weave a culture of sustainability into the everyday fabric of our campus and community. We will strive to enhance the physical and mental health as well as the quality of life of our campus community. •• Incorporate the tenets of sustainability into all student programming. •• Identify and improve the environmental quality of our indoor and outdoor spaces. •• Create an online sustainability education module for staff and develop departmental Green Teams. •• Support physical health through fitness access and active design principles. •• Train all staff (incoming and retained) on how to infuse the tenets of sustainability into their everyday work at Pitt. •• Support the mental health needs of our students, faculty and staff. •• Create and deploy a comprehensive campus survey on student, staff, and faculty sustainability literacy by 2020. •• Embrace LEED and WELL Building Certifications, and WELL Communities for our built environment. •• Share our stories of impact as leaders on a national scale and promote our model of sustainability. A result of a sustainability-related class project, the University of Thriftsburgh is a student-run thrift store co-founded by Anna Greenberg (A&S ‘16) and Paul Heffernan (A&S ‘15). The store’s mission is to be a working model of sustainability, encouraging students to think about how to reuse and recycle in a whole new way while also supporting fair labor practices and campus-wide sustainability efforts through donations to the Pitt Green Fund. The Stress Free Zone is a space where students can learn and regularly practice evidence-based mind/body stress reduction skills. These skills are primarily taught through mindfulness meditation, a form of attention training that involves an intentional, nonjudgmental observation of the present moment. We will continue to engage across campus to ensure that we are providing access and opportunity to all members of the Pitt community. GOALS AND ASPIRATIONS •• Strive to create a resource net for incoming students that will allow us to proactively meet our students’ physical, social, financial, and mental health needs. •• Form a committee or task force to consider socially responsible investing, to be composed of faculty, staff, student and administration representatives. •• Work across all impact areas of the Pitt Sustainability Plan to ensure benefits for all within the Pitt community. •• Integrate the tenets of sustainability into the University’s procurement policies and guidelines. SUCCESS STORIES The Pitt Pantry is dedicated to ensuring that all students have regular access to a balanced and nutritious diet by hosting regular shopping hours for students to obtain food and services. The Pitt Pantry is managed through the Office of PittServes with a dedicated team of student volunteers. The Pantry is supported through donations from the Pitt community and a partnership with the Greater Pittsburgh Community Food Bank. JESSICA E. COHEN (A&S ‘17, SOC WK ‘17): A FIGHTER FOR FOOD SECURITY Solving food insecurity issues is a passion for Jessica Cohen, president of Pitt’s Food Recovery Heroes from 2015 to 2017. Cohen believes that shelter and food are basic human rights. A recent graduate with a Social Work and Communications major, Cohen co-founded Food Recovery Heroes almost four years ago with co-founders Jonae Lloyd (A&S ‘15) and Samuel Ministero (A&S ‘15). A truly dedicated and tireless leader, Jessie led a group of 30 Food Recovery Heroes, who collected and donated unsold salads, sandwiches, doughnuts, cookies, and pastries to local organizations and food banks in the city. They also helped the Greater Pittsburgh Community Food Bank to raise money over a two-year period . These efforts helped Pitt to gain recognition as the first designated Food Recovery Certified ACC school. The Food Recovery Heroes were awarded the Pitt Sustainability Award in April 2017 for their contribution to fighting food insecurity. Food Recovery Heroes helped to prepare food for families at the Ronald McDonald House, a home away from home for families with children receiving world-class care at the Children’s Hospital of Pittsburgh of UPMC. We will strive to build food systems that support a healthy body and a healthy planet, strengthen local communities, and minimize waste. We understand that our campus and our community are part of a larger set of systems and will embrace Pittsburgh sustainability initiatives to be leaders within the region. GOALS AND ASPIRATIONS •• Support a local, fair, ecologically sound, and humane food system by expanding the Real Food Challenge across campus to serve 25% Real Food by 2025. •• Serve 50% of to-go meals and beverages in reusable containers by 2025. •• Serve meals that put plants at the center of the plate by decreasing the amount of animal-derived products sold by 25% by 2025 (from 2017 baseline). GOALS AND ASPIRATIONS •• Take active leadership roles in sustainability initiatives in Oakland, Pittsburgh and the surrounding region and demonstrate solutions to our grand challenges. •• Incentivize sustainability activism and community work and provide opportunities for volunteerism, internships, service, and community engagement efforts that focus on sustainability. •• Create a process of greater transparency between Pitt and our community for knowledge sharing and capacity building (building the tools for empowering change). •• Embrace a culture of impactful service through long-term investment in our communities. SUCCESS STORIES As the Environmental Chair of the Student Government Board (SGB) in the year 2014-15, Kacy McGill, along with fellow SGB members Linda Sun and Mikhaila Rice, worked with the Office of PittServes and Dining Services to create the Pitt Farmer’s Market. The event provides the Pitt community with access to fresh, sustainable, and local food produced within 250 miles of campus. SUCCESS STORIES Community Engagement Centers are being established in select Pittsburgh neighborhoods. These centers will help us to further engage sustainability teaching and research projects with partners in those neighborhoods. The first center will be in Pittsburgh’s Homewood neighborhood. IMPACT AREAS AT A GLANCE | STEWARDSHIP | EXPLORATION | COMMUNITY AND CULTURE ENERGY AND EMISSIONS P.9 •• Strive toward climate neutrality, with a goal to reduce GHG emissions by 50% by 2030 from 2008 baseline. •• Produce or procure 50% of the University’s electric energy portfolio from renewable resources by 2030. •• Embrace 2030 District goals of 50% reduction below the national average in energy use intensity (consumption per square foot) by 2030 (from 2003 baseline) and establish design standards and operational practices to achieve them. •• Increase active Pitt registered carpools by 2% and create 1 new vanpool annually between FY2018 and FY2030. •• Reduce Pitt Shuttle fuel usage by 3% annually between FY2018 and FY2030. MATERIALS AND WASTE P.11 •• Establish procedures, policies, practices, and educational tools to reduce the quantity and environmental impact of materials entering and exiting the University. •• Reduce landfill waste by 25% by 2030 from 2017 levels. •• Adhere to Pitt’s Sustainable Landscape Design Guidelines in all new landscape designs. •• Use healthy products for our built environment in accordance with future Pitt Green Building Standards. •• Increase tree canopy by 50% and replace 15% of lawn area with indigenous and adapted plants by 2030. (from 2017 baseline). •• Expand the food waste composting program to compost 50% of food waste by 2025. •• Maintain at least 75% of landscaped areas in accordance with Northeast Organic Farming Association (NOFA) Standards for Organic Land Care by 2024. TRANSPORTATION AND MOBILITY P.10 •• Achieve Silver-level Bicycle-Friendly University status from the League of American Bicyclists by the end of FY2020, and Gold by the end of FY2025. •• Embrace the 2030 District goal of 50% reduction below the district average greenhouse gas emissions from commuter travel and direct transportation by 2030 (from FY14 baseline). rain gardens, bioswales, or rainwater harvesting tanks by 2030. TEACHING AND LEARNING P.13 •• Engage all undergraduate advisors and give them the tools necessary to connect interested students to sustainability- themed courses, majors, minors, internships, and community activities. •• Annually increase the number of students applying for and graduating with the Undergraduate Certificate in Sustainability starting with the 20172018 Academic Year. •• Increase sustainability-related service learning opportunities. •• Incorporate sustainability education into all freshman seminars. •• Create faculty tools, workshops, and incentives to encourage the incorporation of sustainability components into current syllabi. RESEARCH P.13 •• Use the Pitt campus as a living laboratory for faculty and students to implement new ideas and study outcomes over time. •• Provide more opportunities and incentives for interdisciplinary research as well as the bridging of academics and operations – promoting an environment of informing and working together. •• Raise external funds for endowed chair(s) to support faculty with research expertise in sustainability. •• Develop an endowed seed grant fund to provide greater opportunity for sustainability focused federal grants. •• Invigorate our existing programs to increase the impact of sustainability education in the K-12 curriculum. •• Increase the number of sustainabilityrelated patents, licenses, and start-ups (both for profit and non-profit). •• Collaborate with Pitt’s Innovation Institute, the University’s hub for innovation and entrepreneurship, to embed sustainability principles throughout the Institute. •• Work across impact areas to define innovations and ensure that there is a mechanism for students, faculty, and staff to advance ideas for impact. •• Create an online sustainability education module for staff and develop departmental Green Teams. •• Train all staff (incoming and retained) on how to infuse the tenets of sustainability into their everyday work at Pitt. •• Create and deploy a comprehensive campus survey on student, staff, and faculty sustainability literacy by 2020. •• Share our stories of impact as leaders on a national scale and promote our model of sustainability. •• Increase the number of sustainabilityrelated international service projects. •• Track sustainability-related service and study abroad opportunities for students. •• Find alumni who are leading sustainability initiatives both nationally and internationally and connect them with University faculty and students. •• Promote sustainability-related topics at industry and academic conferences to tell our stories of impact to greater audiences. PARTNERSHIPS P.15 •• Connect with industry and community collaborators to support applied sustainability research and education. •• Establish local and regional partnerships to accelerate the transfer of sustainability ideas from Pitt classrooms and laboratories through implementation. •• Link sustainability and Community Engagement Centers more explicitly. •• Support the mental health needs of our students, faculty and staff. •• Embrace LEED and WELL Building Certifications, and WELL Communities for our built environment. EQUITY AND ACCESS P.18 •• Strive to create a resource net for incoming students that will allow us to proactively meet our students’ physical, social, financial, and mental health needs. •• Form a committee or task force to consider socially responsible investing, to be composed of faculty, staff, student and administration representatives. •• Work across all impact areas of the Pitt Sustainability Plan to ensure benefits for all within the Pitt community. •• Integrate the tenets of sustainability into the University’s procurement policies and guidelines. FOOD SYSTEMS P.19 •• Support a local, fair, ecologically sound, and humane food system by expanding the Real Food Challenge across campus to serve 25% Real Food by 2025. •• Serve 50% of to-go meals and beverages in reusable containers by 2025. •• Serve meals that put plants at the center of the plate by decreasing the amount of animal-derived products sold by 25% by 2025 (from 2017 baseline). CITY/REGIONAL CONNECTIONS P.19 •• Take active leadership roles in sustainability initiatives in Oakland, Pittsburgh and the surrounding region and demonstrate solutions to our grand challenges. •• Incentivize sustainability activism and community work and provide opportunities for volunteerism, internships, service, and community engagement efforts that focus on sustainability. •• Create a process of greater transparency between Pitt and our community for knowledge sharing and capacity building (building the tools for empowering change). •• Embrace a culture of impactful service through long-term investment in our communities. PLAN ENABLERS The Pitt Sustainability Plan strives to make a measurable impact in advancing its vision for a sustainable future. We realize that this plan will be faced with both challenges and opportunities that require a dynamic framework of strategies to achieve the goals and aspirations in the plan. The plan elevates five enablers which are critical to establishing the foundation for success. They are overarching in that they must be thought of as elevating all aspects of sustainability at Pitt to achieve institutional change. They are cross-cutting in that they are necessary as catalysts for the three themes: Stewardship, Exploration, and Community and Culture, and will help to guide each impact areaâ&#x20AC;&#x2122;s goals and aspirations. Sustainability initiatives are not held in one department or office at Pitt. They are happening daily throughout our community in various ways. These enablers will help to coordinate and advance the efforts of all areas through organization, communication, and celebration. Pitt is using these plan enablers to create short-term directives, which inform immediate actions coming out of this plan. Many of the initiatives listed here are happening in various ways on campus today but need higher-level buy-in and resources for them to be formalized. We will facilitate the implementation of comprehensive sustainability programs at Pitt with clearly defined organizational and leadership roles and campus-wide policies that will affect change. We will educate all members of the Pitt community on the three tenets of sustainability, providing them with the tools to be better University and global citizens. Establish an Office of Sustainability to oversee and coordinate the implementation of sustainable initiatives across the University. Integrate sustainability awareness into student and employee orientation programs. We will create mechanisms for fostering collaboration, connection, and exploration among our academic, research, and administrative areas, operations, students, and community partners. We will establish efficient and effective collection and dissemination of data for the purpose of accountability and transparency within the University community. We will elevate our stories of impact to the world so that Pitt is recognized globally as a university that influences, guides, and affects change. Establish mechanisms for facilitating new connections and launch and fund a Living Lab program. Develop a performance-tracking and analysis dashboard integrated with the Plan for Pitt. Build up to ten success stories and publish them in print and online media. PLAN ENGAGEMENT and the Pitt community members. The interviews strengthened engagement with students and gave voice to perceptions of sustainability on campus while also promoting awareness of the work being done on the Pitt Sustainability Plan. Through a series of quick question-and-answer rounds, students expressed how important sustainability at Pitt was to them and their appreciation for the University’s ongoing efforts to develop a comprehensive sustainability plan. SURVEY UNIVERSITY SUSTAINABILITY COMMITTEE The University Sustainability Committee is committed to establishing sustainability goals across campus, monitoring the implementation of strategies, and creating a formal process for reporting sustainability goals and metrics. The Committee was assembled in October 2016 with representation from Pitt’s staff, faculty, and students and was charged with developing a comprehensive sustainability plan for the University. Over various working sessions, the committee benchmarked sustainability efforts in campus operations, education, and outreach, and made recommendations to implement standards and best practices. The Pitt Sustainability Plan was created as a tool for collaborative integration of sustainability across every aspect of the University. The Pitt Sustainability Plan incorporates the thoughts and ambitions of a diverse cross section of Pitt’s student, faculty, and staff communities. The University Sustainability Committee launched the Pitt Sustainability Survey in March 2017 to understand perceptions, behaviors, and aspirations related to sustainability among members of the campus community. With a total of 1,050 responses, the online survey provided meaningful contributions to the plan, informing its goals and aspirations. The survey results clearly demonstrate that the Pitt community cares deeply about the environment and about sustainability issues on campus. COMMUNITY LEADERS The University Sustainability Committee realizes that the impact of the Pitt Sustainability Plan extends beyond campus borders. In accordance with the University’s long-standing tradition of striving to serve the local community and the Pittsburgh region in its activities, the committee engaged in conversations with various local partners about sustainability activities at Pitt. Carnegie Mellon University, the Green Building Alliance, the Oakland Business Improvement District, the Oakland Transportation Management Association, the Oakland Planning and Development Corporation, and the University of Pittsburgh Medical Center provided valuable insights into the successful implementation of the Pitt Sustainability Plan. WEBSITE AND TWITTER To keep the Pitt community up to date on news, events, and progress related to sustainability, a refreshed, interactive version of the sustainable.pitt.edu website will be unveiled in 2018. 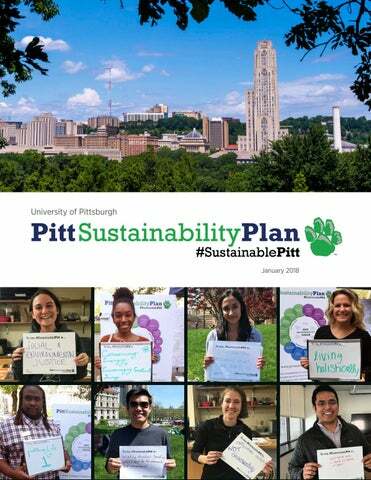 During the engagement phase, the PItt Sustainability Plan took to Twitter (#SustainablePitt) to tweet about the plan and ongoing sustainability activities. The Sustainability Committee is working with University Communications to continue to engage the community through various news outlets, the website, and social media. PUBLIC ENGAGEMENT The Committee set up a booth at the Pitt Farmers’ Market in April 2017 and gathered feedback on the Plan from a larger community of staff, students, alumni, prospective students, and Pittsburghers. The booth had four quick exercises: Photo Booth, Hits and Misses, Voting (with gum balls), and Big, Bold Ideas. The Photo Booth activity gave the Pitt community a chance to make their voices heard, as participants held hand-written signs with their thoughts on the Plan in front of the camera. The Hits and Misses exercise provided staff and students with an opportunity to point out sustainable and unsustainable practices on campus. Through the gum ball voting, the community voted for the three Impact Areas most important to them for the Pitt Sustainability Plan. Lastly, the Big, Bold Ideas exercise encouraged the community to post their thoughts, concerns, and ideas on a board. MAJOR TAKEAWAYS FROM PLAN ENGAGEMENT 1. There is good work in sustainability at Pitt. There are many achievements, but we need to do a better job at telling our stories. 2. Sustainability at Pitt can’t be “green-washed.” There is a need to be honest with challenges. 3. There needs to be more interaction and collaboration between the University’s organizational branches: operations, academics, research, and athletics. 4. It is critical to connect to the Plan for Pitt for high-level buy-in and consistency. 5. The planning effort needs breadth but should also focus on short-term wins for Pitt. 6. Pittsburgh is our campus. Our urban setting and connection to the city is a key differentiator for this plan. 7. It is critical to track and report performance and progress at Pitt. 8. The Pitt campus should be a Living Lab, increasing transparency and using the campus to teach and highlight our achievements to the community. REGIONAL CAMPUSES Regional campuses were an integral part of the Plan and are vital to the success of sustainability at Pitt. The following are just samples of the efforts happening on the regional campuses, representing the great advocacy and advancement of sustainability tenets throughout the University. Pitt–Greensburg A four-year liberal arts college surrounded by the Laurel Highlands and minutes from sought-after city amenities, the University of Pittsburgh at Greensburg (UPG) is situated on 219 acres encompassing woodlands and Slate Run creek. Native trees, shrubs, and wildflowers adorn the campus roadways. Care is taken to preserve the water quality of the creek, which is a legendary trout fishing destination. Home to Frank A. Cassell Hall—a LEED Gold-certified building that boasts native landscaping with bioswales, natural lighting, radiant floors, and two green roofs that harvest rainwater—UPG is realizing significant energy savings. Recycling and other greening efforts are growing and include a composting program, reduction of dining hall waste, and paper elimination. Pitt–Johnstown Nestled in a wooded mountain setting comprising 655 acres, the University of Pittsburgh at Johnstown (UPJ) is our first and largest regional campus. In an effort to maintain the picturesque integrity of the setting, during the original campus construction, then-President Theodore Biddle required that the utility companies install their lines around many of the existing mature trees. In 1967, Look magazine featured the state-of-theart campus heating system where heat created from individuals, lighting, and equipment in the classrooms was recycled for use in other buildings. Today, UPJ continues this tradition of reducing its environmental impact with numerous endeavors, including recycling, plastic waste reduction, energy efficiency, sustainable dining practices, and LEED-certified construction. UPJ Sustainable Kitchen To increase safety and efficiency and create a more environmentally friendly kitchen, Pitt-Johnstown is introducing a closed-loop, automated oil management system. The new process will help reduce landfill waste by delivering fresh cooking oil in bulk and recycling used cooking oil into biodiesel. This approach is expected to eliminate 12 three gallon jugs per week or 1,200 gallons per year from landfills as well as minimize injuries from slips and heavy lifts. Pitt–Bradford Centered around the natural environment, with the hiking trails and streams of the Allegheny National Forest providing a scenic backdrop, the University of Pittsburgh at Bradford (UPB) is a 317-acre campus offering two sustainability-focused degree programs. UPB, with a sustainability committee established in 2011, has been recognized for its commitment to sustainability and the environment. It was named to the Princeton Review’s list of green colleges and designated a Tree Campus USA college by the Arbor Day Foundation. This effort is further evidenced by the offering of free public bus transit, sourcing food from organic or local options, diverting 54 percent of its waste from landfills, and installing solar panels. UPB Compacting Converting the campus-wide, multi-stream recycling program to single-stream reduced collection costs by 66%. The savings paid for the new multi-stream compactor, which replaced three open containers, in three years. Coupled with student participation and education, recycling has increased to over 150 tons annually. Pitt–Titusville Two hours north of Pittsburgh, encompassing ten rural acres, the University of Pittsburgh at Titusville is Pitt’s only two-year campus. Built around McKinney Hall, a mansion originally constructed in 1873, the campus is located on and around the former McKinney estate. Donated in 1963, it is a notable example of reuse, as is Bennett Davis Hall, which served as the former carriage house for the estate. In 2007, McKinney Hall was awarded the Crawford County Historical Society’s Preservation Award for a multiple-use structure. ACKNOWLEDGEMENTS University Sustainability Committee Co-chairs Illona Beresford, Project Architect, Facilities Management Division Scott Bernotas, Associate Vice Chancellor for Facilities Management Division Dan Fisher, Assistant Vice Chancellor for Operations and Maintenance, Facilities Management Division Richard Heller, Senior Electrical Engineer, Facilities Management Division Gena Kovalcik, Codirector, Administration and External Relations, Mascaro Center for Sustainable Innovation Erika Ninos, Sustainability Program Coordinator, Office of PittServes, Division of Student Affairs Laura Zullo, Director of Administration in the Office of the Senior Vice Chancellor for Business and Operations University Sustainability Committee Members R. Ward Allebach, Instructor, Environmental Studies Program, Department of Geology and Environmental Science Drew Armstrong, Director of Architectural Studies and Associate Professor, Department of History of Art and Architecture Melissa Bilec, Deputy Director, Mascaro Center for Sustainable Innovation Marcus John Bowman, Senior Associate Athletic Director, Department of Athletics Amy Buxbaum, Vice President for Finance and Administration, University of Pittsburgh at Johnstown Keith Duval, Environmental Manager, Department of Environmental Health and Safety RĂŠnee Galloway, Supplier Diversity and Sustainability Coordinator, Panther Express Purchasing Services Nicholas Goodfellow, Sustainability Coordinator, Dining Services (Sodexo) Gina Gowins, Alternative Transportation Coordinator, Department of Parking, Transportation and Services Ellie Graves, Editor, Office of University Communications Thomas T. Heidkamp, Property Manager, Surplus Property Warehouse Christopher Keslar, Senior Analyst, Development Services Group, Computing Services and Systems Development Matt Kropf, Director of Energy Institute, Assistant Professor of Energy Science and Technology, University of Pittsburgh at Bradford Kathy Paterniti, Executive Assistant to the Associate Vice Chancellor, Facilities Management Division David V. P. Sanchez, Assistant Director, Education and Outreach, Mascaro Center for Sustainable Innovation Elizabeth Tiedemann, Registrar, University of Pittsburgh at Greensburg Matthew Walaan, Business and Personnel Manager, Department of Housing The planning team gives special thanks to our student leaders in the Student Office of Sustainability (SOOS) and all of the dedicated students who participated in the Planâ&#x20AC;&#x2122;s development. Your commitment and dedication were instrumental to the process. We would like to express our deep gratitude to Chancellor Patrick Gallagher and Provost Patricia Beeson for their constant support and encouragement throughout the development of the Pitt Sustainability Plan. Thank you to Professor Buck Favorini and the University Senate Sustainability Subcommittee for their pioneering contribution to sustainability initiatives at Pitt. We would like to thank the following partners for their valuable contributions and insights that improved this report: Carnegie Mellon University, the Green Building Alliance, the Oakland Planning and Development Corporation, the Oakland Business Improvement District, the Oakland Transportation Management Association, and the University of Pittsburgh Medical Center. We also would like to extend our thanks for the input and assistance provided by the Office of University Communications team and our planning consultants at BuroHappold Engineering, specifically Steven Baumgartner, Christopher Rhie, and Abhishikta Pal.